I never thought I spoke the lines until my family told me I did. They said they could walk by and tell if it was going well or not by the rhythm of it. I guess I want to see if I’m repeating words and, because I write primarily for the stage, I want to make sure the words won’t be tripping badly over some tongues. When I wrote the Sergeant Bilko show my father asked me naively, Do you just write Sergeant Bilko’s lines or do you write the other lines too? When you write a play, maybe even a novel, you become everybody. It may seem like I only write the lines spoken by the character who is like Neil Simon, but in Lost in Yonkers I’m also the grandmother—and Bella. And to do that you have to become that person. That’s the adventure, the joy, the release that allows you to escape from your own boundaries. To be Grandma every other line for a couple of pages takes you into another being. It’s interesting how many people ask, Was this your grandmother? I say, No, I didn’t have a grandmother like that, and they say, Then how do you know her? I know what she sounds like. I know what she feels like. The boys describe it when they say, When you kiss her it’s like kissing a cold prune. I describe her in a stage direction as being a very tall, buxom woman. But she doesn’t necessarily have to be tall and buxom. She just has to appear that way to the boys. You can’t really use that as physical description, but it will convey something to the actress. (W)hen Come Blow Your Horn was playing, the theater doorman, a black man in his sixties, was standing in the back of the theater, laughing his head off. I went over to him after the play and asked, Why were you laughing so much? He said, That’s my family up there. I don’t write social and political plays, because I’ve always thought the family was the microcosm of what goes on in the world. I write about the small wars that eventually become the big wars. It’s also what I’m most comfortable with. I am a middle-class person, I grew up in a middle-class neighborhood. I try now and then to get away from the family play, but it amazes me that I’ve spent the last thirty-one years writing plays primarily about either my family or families very close to it. Maybe the answer is that at some point along the way you discover what it is you do best and writing about the family unit and its extensions is what I do best. If you’d like to read what people such as Arthur Miller, Sam Shepard, Joyce Carol Oates and other famous — and not so famous — playwrights have to say about the art and craft of writing for the stage, type “On Playwriting” into the small sidebar window and tap the “Search” button. 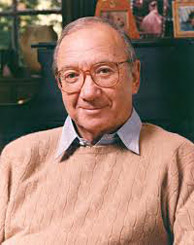 Part IX of the Neil Simon series will post next Wednesday. This entry was posted on Wednesday, August 22nd, 2012 at 7:51 am and is filed under acting, actors, comedy, couples, family, humor, movies, playwriting, quotes, relationships, theater, writing. You can follow any responses to this entry through the RSS 2.0 feed. You can leave a response, or trackback from your own site.